Singer Christina Aguilera sings the National Anthem during Super Bowl XLV at Cowboys Stadium on February 6, 2011 in Arlington, Texas. 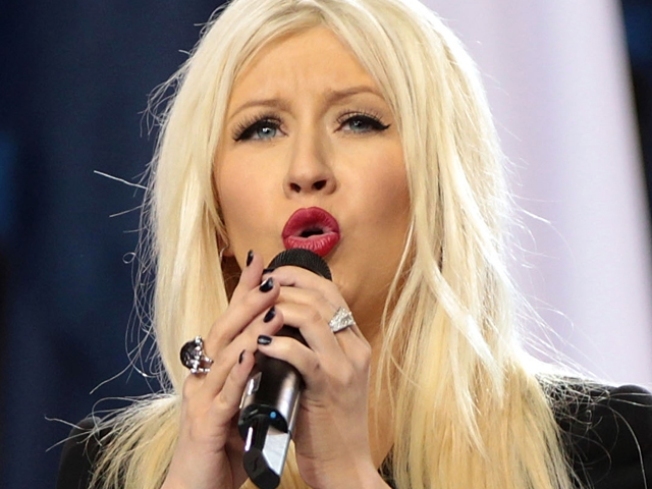 Christina Aguilera is being given a chance to redeem herself after her embarrassingly botched performance of the National Anthem during last Sunday's Super Bowl. The pop star will be singing Aretha Franklin's biggest hits with four other singers in a tribute to the legendary diva during the Grammy Awards this Sunday. This time around, the blonde "Burlesque" star has no excuse for missing a beat. An insider to the big music awards night told PopEater's Rob Shuter that "all the lyrics to her bumber will be in a TelePrompter at the event so it will be almost impossible for her to mess up again." After flubbing the lyrics to "The Star-Spangled Banner," Aguilera's musical faux-pas has gotten as much attention as the Green Bay Packers' win against the Pittsburgh Steelers. Instead of belting "O'er the ramparts we watch, were so gallantly streaming," the "Dirrty" singer sang, "What so proudly we watched at the twilight's last reaming." Aguilera released a statement shortly after the incident, explaining she got lost in the moment and "can only hope that everyone could feel my love for this country." The Brooklyn Cyclones, a minor league baseball team, has also pitched Aguilera on a public do-over. It's unclear if Aretha Franklin will attend the Grammys. The 68-year-old is recovering from surgery in December. She has not disclosed what she was treated for, but last month shot down rumors she had pancreatic cancer. Jennifer Hudson, Martina McBride, Yolanda Adams and Florence Welch will definitely be booming their voiceboxes along with Aguilera for the number. Franklin may be the subject of the opening tribute, but all eyes (and ears) will surely be on Aguilera.